The original square, named Place du Château d’eau, was replaced by the present Place de la République, constructed from 1856 to 1865. The boulevard du Temple, called the boulevard of the murders because of the numerous theaters where each night murders were committed on stage, was partly razed. In 1883 the statue to the Republic by the Morice brothers was erected. Standing in front of it is a loin holding the ballot box of democracy and sitting at its base are the statues symbolising Liberty, Equality and Fraternity. Below are twelve bronze low reliefs superbly cast by Dalou. 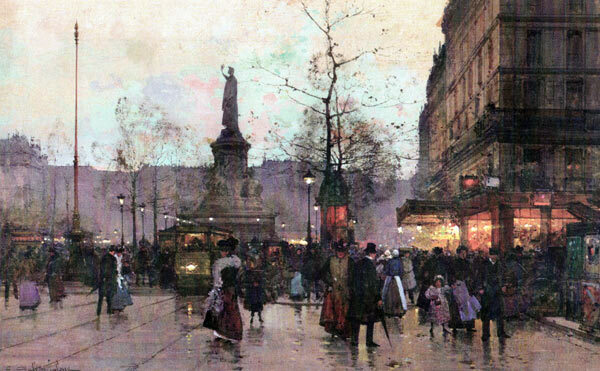 « There are in Paris some streets which have fallen into disgrace exactly like a person guilty of a vile action. You may also encounter aristocratic – or simply gentle – street, new ones whose decency hasn’t been verified yet, streets that are always clean or always dirty, those which are hard-working, industrious, money-making.